Follow a workshop to make your own Accessoires. Ordering is also possible. For more information or questions send an e-mail. Regency Jewelry, were lush. Necklaces, bracelets and earrings were often featuring a Cameo (stone with carved female head). Jewelry with cameo can be ordered or make your own during a workshop. Masks we come across for the first time in 1268. They were worn especially inVenice, but also at parties or when someone wanted to walk anonymously across the street. In Napoleon’s time this tradition disappeared to the background. 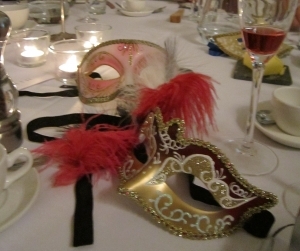 Now masks are worn at parties or at the Venetian Carnival, which lasts for 12 days. Create your own mask during a workshop, or you can order one. They can be decorated with decoupage,ribbon, feathers and paint. Fans were used to cool off when it was hot, and also for a ‘secret language’. Fans are first mentioned in 300 B.C. 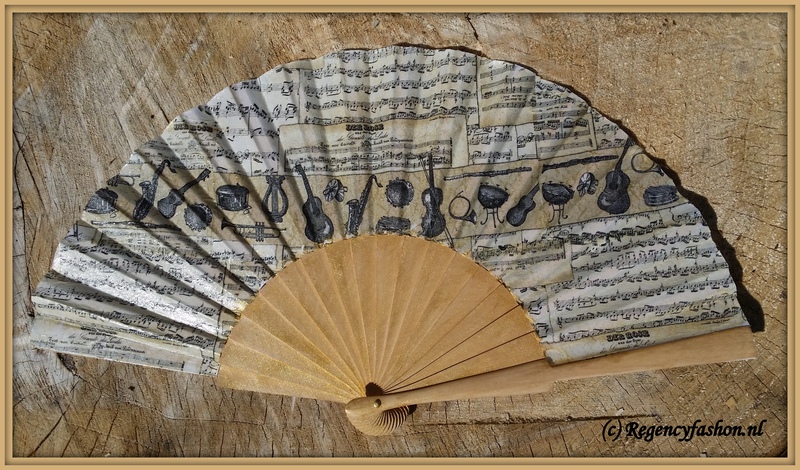 In the 17th century folded fans are mentioned for the first time. 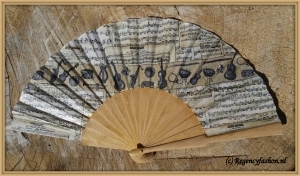 In the 18th and 19th century the fan was used for the so called ‘fan language’ which was very popular, everyone knew the technique and signals. If a lady held her fan closed against the mouth, she meant that she was interested in her partner. The fan closed with the arm sideways, meant that she was no interested at all. With suddenly waving her fan very fast; She showed her love. Create or make your own fan yourself during a workshop. Or order one. They can be decorated with decoupage, feathers and paint. 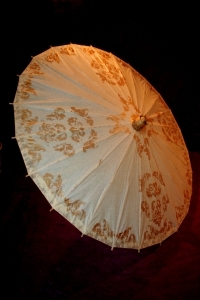 Parasols were widely used by ladies in the Regency period. For protection against the Sun. Parasols are the non-water-version of umbrellas, and were made of paper or cloth, decorated with frills, beads, ribbons, paint, decoupage etc. Create or order your own Parasol. In the evening long gloves and often a tiara were worn. With a matching Reticule a small, decorative handbag in which Regency ladies carried their handkerchief, toiletries and other necessities. Men wore a neckband or cravat, draped over the collar. Made of a light coloured strip of fabric. It is possible that cravats were initially worn to hide shirts which were not immaculately clean.